Moving can be a stressful experience for you and your family, so don’t forget it is also a stressful time for your pet. Pets can get used to a routine and what’s familiar. They also sense when their family is stressed and can pick up on your feelings. That is why it is always good to baby your pet when you’re moving. Before you pick your new house or apartment, be sure and remember to consider your pet. Do you have a good place to walk your dog? If you don’t have a fenced back yard, is there a dog park nearby? Are you allowed to have pets? The best way to keep your pet from feeling stressed is to spend time with your pet. You will also find the more planning you do the less stress there is on you. If you will be traveling either by car or airplane, there are certain things you can do to accommodate your pet. Make sure that you follow all the regulations of the airline if you're flying. If you will be staying overnight, make sure your hotel is pet friendly. Pack a travel bag for your pet with some of his or her favorite things. Your veterinarian is a good source to help you get your pet ready for moving. You will want to make sure all their shots are up to date. You are better off getting extra shots that will help if you need to board your pet in an emergency. This will eliminate the stress and cost of getting those shots at a new boarding facility or an emergency clinic. Talk to your vet about sedating your pet or other options of calming your pet. Your veterinarian will be able to recommend the best sedation and what will be safe considering how you are traveling. Over stressed pets can act in bizarre ways, biting when they normally wouldn’t or running away. Make sure you get copies of all your pet’s health records. Many times a rabies tag is not acceptable proof of your rabies vaccination. Also a health certificate may be necessary if you’re traveling by air or staying in certain places. Many people find boarding their pets the weekend of the move to be a good idea. Having movers and strange people going in and out of the house can be very intimidating to a pet. Many times pets will hide or run away in the confusion. If you can’t board your pet, keep them in a closed room away from the hectic traffic of moving. Be sure and get plenty of pet food to last through the move and a few weeks after you move. You don’t want to be searching for food or a pet store as soon as you arrive in your new location. It is also not a good time to switch foods. Keep a watch on your pet to make sure they don’t get dehydrated. Some animals quit eating during stressful times and you don’t want to complicate the move with a sick pet. 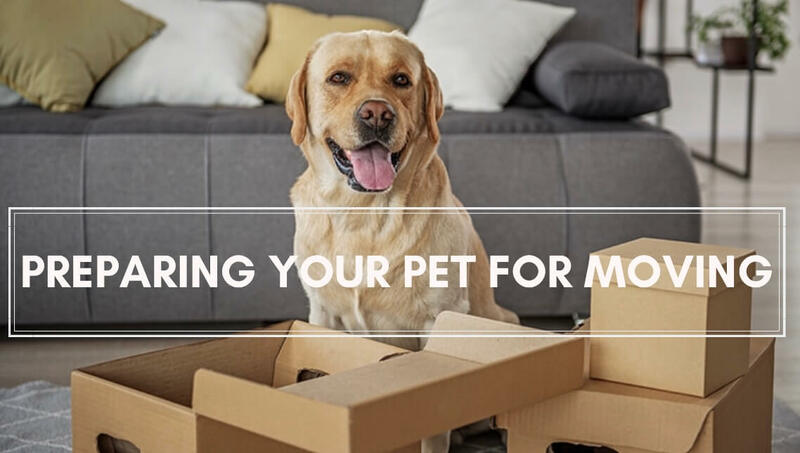 Spend time walking your pet and playing with them before the movers come. This will help with extra energy or anxiety they may have. Check your new home and any outside yard to make sure they are pet proof before you turn your pet loose. Spend plenty of time reassuring your pet and playing with them. Make sure they know where their new place is and that you have plenty of their familiar belongings at the new house. Resist the urge to buy a new bed for your pet until after the move is over and you have settled in for a while. Find a new veterinarian quickly so that you aren’t stuck looking for one in an emergency. Also be sure and update your microchip or pet tags with your new address. Moving can be a traumatic time for your pet. Hopefully these hints will help you keep your pet healthy and as stress free as possible during your move. We hate to hear our patients are moving but we are glad to assist in any way we can. Likewise, if you are new to the area and looking for a Richmond veterinarian, you have come to the right place. We will be happy to help with transferring records and do all we can to help your pet feel right at home.